So I didn’t post at all this week, which is why I’m posting now. And it’s not even like I didn’t have time to post, either. I just didn’t. I finished exams on Wednesday, and so all this week, I’ve been doing absolutely nothing. I have only left my bed in the last 48 hours to eat or watch Netflix. You know how sad that is? It’s really sad. I put on real pants for the first time in 3 days today. But it’s been just wonderfully wonderful. There’s something about just doing nothing after being so hectic for so long that’s very therapeutic. Coming home after living away takes some getting used to. You don’t have the same independence as at school. Even though my parents never hover or anything and I have a lot of freedom, it still takes some time to get back into things. Freedom and independence are very difference–freedom is given to you. When you’re independent, no one can give or take away anything from you, because they don’t have that power. I’m not sure that makes sense, but that’s what I’ve boiled it down to in my mind. So where I live in Eastern Ontario there is a huge freezing-rain storm coming our way, and we got the beginning of it last night. It left our entire city in a sheet of ice about an inch thick! It’s crazy out there! Now, any normal person (normal being the operative term here) would decide to call it a day, stay in bed and catch up on e-mails, drink some hot chocolate, and just wait out the storm. But what did I decide to do? Skate on my driveway of course. I quickly realized that the ice had transformed my plain old asphalt driveway into a personal ice-rink! So I strapped on my skates, got onto the ice, and started skating! Needless to say it was pretty crappy ice, and there were tons of holes and chunks and the like, but there was one part that I could actually skate on which was fun. The sidewalks are all covered, as well, so you can skate up and down the street. Pretty sure I’m going to need a major sharpening, but hey! It was worth it. So that was my silver lining from the storm. Then I spent the rest of the day trying to get this blog in order. Completely changed how it looks, started to schedule posts again, and I’m getting super pumped for the new year! :) My time of rest was fun, but I’m glad to be back to work again. And hey–if the storm gets really bad and we can’t leave, then I’ll get a ton of writing done! Man, I’m feeling so optimistic today. Do you guys have a white Christmas this year? Subscribe to get weekly newsletters that include exclusive content, behind-the-scenes look, sneak-peeks of what's to come, weekly round-ups of posts, and more! « 5 Ideas for DIY Christmas Gifts! 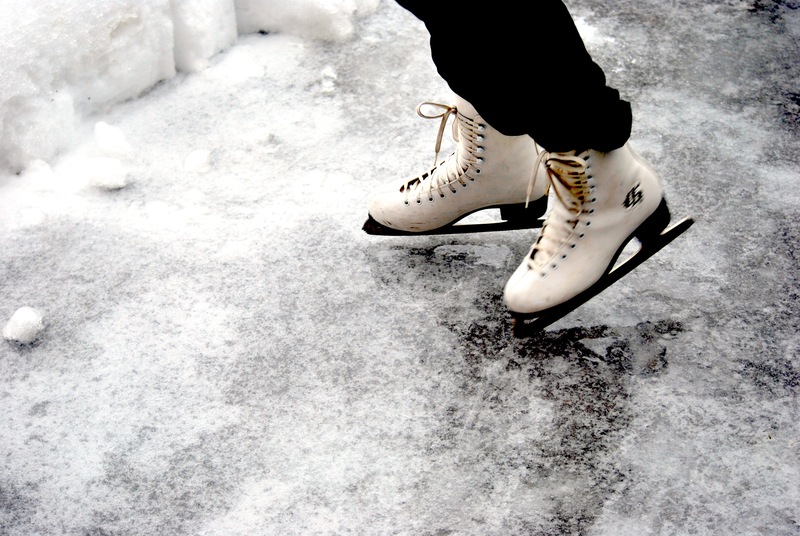 I so want to get hockey skates next–you can go so much faster! :) Although I’ve learned how to run on my picks with my figure skates, so that seems to work too. And that sounds gorgeous! :O Much nicer than the ice storm here! haha And pajama days are great, yeah. :) Especially when you’ve been stressed, so I’m grateful for the opportunity to just sit and do nothing. I live near Erie, PA, which as of right now is the snowiest town in the US. And as of last Sunday, we’d received 41.9 inches of snow so far this year. Well, last Sunday we got a foot of snow overnight. In the last few days, it’s been rainy in the 40’s(F). All of that snow is pretty much gone So I am not sure if there will be snow for Christmas or not. I’m not a fan of snow. I’ve only ever been ice skating once.it didn’t go well. Oh my goodness! that is awful! :O I have friends who live there, actually! :) I understand getting a foot of snow overnight–Ottawa’s the same way! Crazy all around. And I’m not a big fan of snow either, but I love skating :) It’s pretty much all we did growing up. We never did any other sports though, really. GET MY BOOK ON PRE-ORDER! My book is available for pre-order! Buy it now and you'll get the Kindle automatically added to your library or get the physical version shipped to you as soon as they start printing it!